WAAFL coach Clint Testa probably summed it up best, “you spend eight weeks planning for a game, then it all goes out the window in the first minute,” he said. As Sunday came, so did the rain, by the veritable bucket load, quickly turning the much hyped QAFL verses WAAFL contest into a bath and a battle of wills. The Queenland side was stacked with bigger bodies from the start and talls Nathan Quick, Wayde Mills, Jayden Young and Alex Mitchell needed to adjust their mindset for wet weather footy. From the first bounce the West Australians attacked the ball hard, using their speed to their advantage and showing some zip around the contest. The WAAFL lead 14 to 12 after the first quarter, in which QLD skipper Steve Brittain led from the front, crashing and bashing through the middle. It was clear to all watching that these two sides were in for the long haul, as the lead continued to change hands throughout the contest. Neither side was able to dominate the other, goals were hard to come by and the ball was like a heavy block of soap. Despite some dry patches after half time, it was wet weather footy all day. It was the Queensland talls ability to adjust and impact the game at ground level, that proved the difference in the end. Jayden Young and Wayde Mills proved troublesome for the WAAFL in defence, cutting off their entries and creating plenty of rebound for Queensland who ran out winners 5.8.38 to WA 4.11.35. Labrador tall defender Jayden Young was named the Zane Taylor medallist, as the best player on the day, while Wayde Mills, Steve Brittain, Oskar Baker and Nathan Quick also played well. Both Jake Andersson and Jordan Williamson, got plenty of ball and were influential for the visitors. 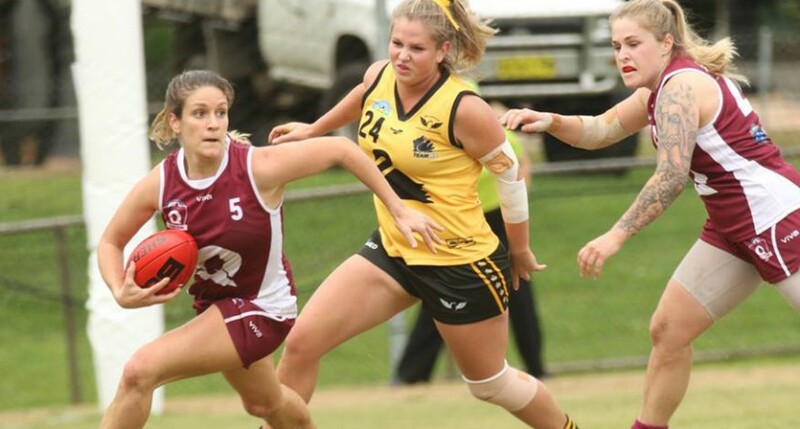 After coming out on top in their first clash with the WA Mundella Under 23 side on Friday night at Yeronga, the Queensland Under 23 women’s side made it two from two on Sunday, getting up 6.8.44 to 2.5.17. As the first match of the Broadbeach ‘double header,’ the game avoided the downpour, and was played with the high intensity and skill level expected of a state clash featuring some of Australia’s best young talent. Small forward and midfielder Maddy Roberts hit the scoreboard, kicking two goals and providing her customary defensive pressure and appetite for the contest. Hard working midfielder Emma Pittman was also up and about, displaying her sharp kicking skills and collecting plenty of the footy. Last year’s Lions players Kate Deegan and Jade Ransfield were both given time through the midfield, giving the coaches an opportunity to see them in different roles.